This is a great watch very accurate. I now have several very nice Stauer watches. This is my favorite. The green face stands out as something you don't see a lot. Thank You Stauer for making great watches affordable. I bought my first Stauer Dive watch in 2007 ..it's still looks and works great I bought my second a few years later ..this new one (my third) arrived today and it is amazing .. upgraded watch band and a magnified date window...anyone considering this watch shouldn't wait...Buy it today you'll love it. Trust me. This is my fourth watch from Stauer. Love it...need I say more! Keep up the good work!!! Every year in Basel, Switzerland, the world’s best-known luxury watchmakers gather to display their new timepieces to each other. It’s a great event for spotting those timepieces that standout– in performance and in personality. 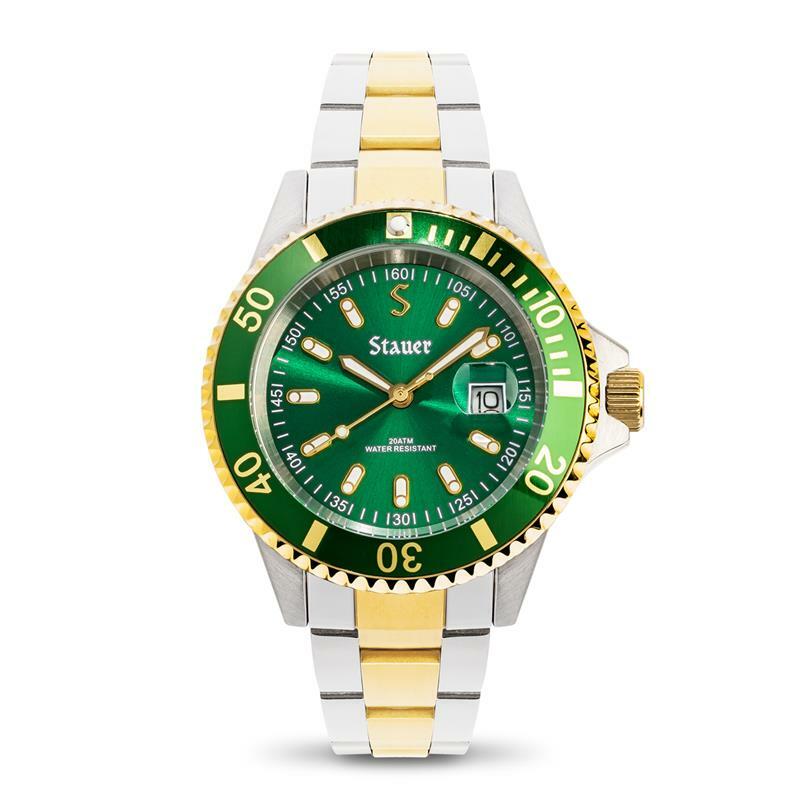 We saw one impossible to ignore: a precision dive watch with an eye-catching green dial. But we also saw the five-figure price tag and knew we could bring our customers that exact same precision and stand out appeal for a whole lot less. 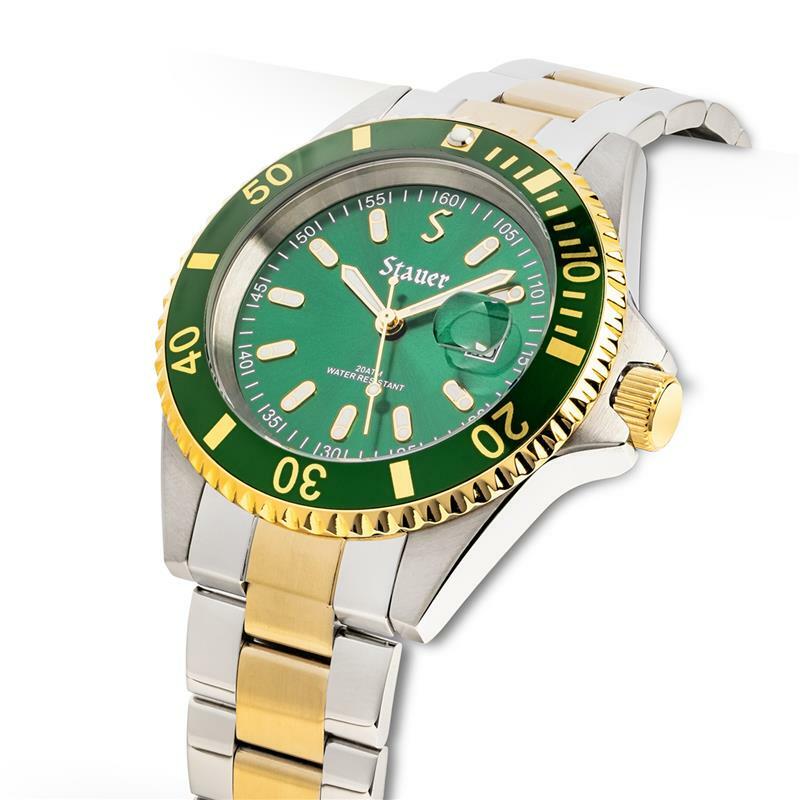 The Stauer Evergreen Diver is that timepiece. Built like a submersible battleship with a stainless steel case, caseback, band and clasp, the Evergreen Diver is water-resistant down to 660 feet or 20 atmospheres, a feat facilitated by a hardened crystal and screw-down crown. This is a watch built to last. We’re excited to roll it out ahead of some of the more historic watchmaking names. You’ll be so far ahead of the curve, you’ll need to use the date window at 3 o’clock to make sure you haven’t traveled to the future. You could pay an awful lot elsewhere for this verdant virtuoso, but the Stauer Evergreen Diver brings the price down, giving you green on your wrist while keeping some extra green in your pocket.